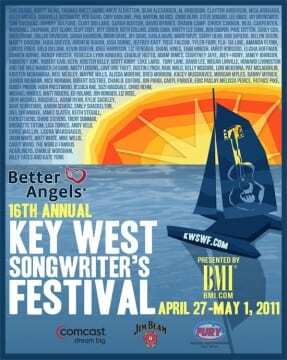 The Better Angels Music Key West Songwriters Festival, presented by BMI, has grown exponentially since debuting 16 years ago. This year’s event, running April 27 through May 1 will offer performances from more than 100 top-tier songwriters. Recently added to the lineup are genre-hopping singer/songwriters Raul Malo, Marshall Chapman, and Robert Earl Keen; serial country chart-toppers Lori McKenna, Bobby Pinson, Liz Rose, Hugh Prestwood, Bob DiPiero, The World Famous Headliners (Al Anderson, Shawn Camp, and Pat McLaughlin), Keith Stegall, Jamey Johnson, Randy Houser, Jerrod Niemann, and Dallas Davidson; and rock-pedigreed singer/songwriters Better Than Ezra’s Kevin Griffin, Bo Bice, Collective Soul’s Ed Roland, and Patrice Pike. Among the numerous previously announced performers are Steve Bogard, Chuck Cannon, Lee Brice, Luke Laird, David Lee, Rhett Akins, Joey + Rory, Sarah Buxton, James Slater, Arlis Albritton, Barry Dean, Tony Lane, Dillon Dixon, Rebecca Lynn Howard, Love and Theft, Eric Paslay, Tony Stampley, Trent Summar, Bridgette Tatum, Jason White, and tons more. The festival will benefit the Wounded Warrior project, an organization that provides aid for injured service members. Anchor sponsor BMI will continue its widespread support of the fest, leading Key West’s annual transformation into a music mecca. Among the event’s highlights will be a full band show by Robert Earl Keen with special opening guest Jerrod Niemann and the Hung Jury on Saturday, April 30.